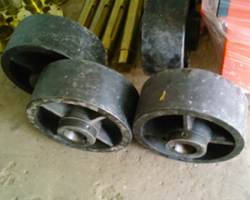 Product Details: Material Metal Surface Finish Polished Vehicle Type Four Wheeler Product Description: Backed by years of industry experience, we are engaged in offering a premium quality range of Pavers Auger Driving Shaft. We are Manufacturing of Asphalt Plant Spare. We offer our customers with a range of Asphalt Mixing Arms that is available at very reasonable prices. These arms are known for their robust quality and versatile performance, which makes them ideal to be used in a number of demanding industrial applications. These have been manufactured using premium quality wear resistance material, while using the latest manufacturing techniques. Leveraging on the skills of our adroit professionals, we are involved in manufacturing high quality Drum Flight for Linhoff Plant. The offered pad is also customized by us as per the requirements of our customers. The offered pad is available in the market at reasonable price. We are dealing in Different types of Empuller Fan / Impeller / Blower Fan. We are using high quality material with heavy Sheets with complete alingment , which is ready to fit in Hot Mix Plant. Our asphalt drum mix plant fix unit is precision engineered to offer high durability and efficiency. With the use of the latest technology and abiding by international parameters, we offer asphalt drum mix plant fix unit suitable for diverse construction activities.